Platitude is an application for creating simple lattices. Lattice drawings describes my interest in them. As a Windows installer: Platitude_100_setup.exe. Simply install it as you would any Windows program. There are no prerequisites. As Python source: Platitude-1.0.zip. To run it, you’ll need wxPython 2.5.3 and Jason Orendorff’s path module. Modifying the lattice is done by clicking in the spaces between the traces. Each click changes the four sides around it. If the side has a trace on it, the trace is removed. If the side has no trace, a trace is added. This ensures that the traces are always unbroken, and form complete circuits. 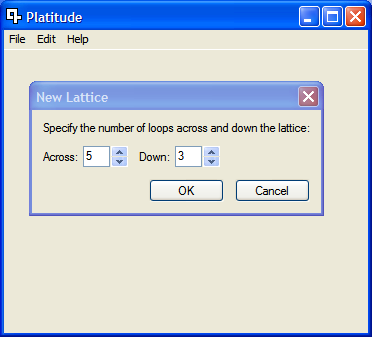 Lattices can be saved to .lat files with File - Save, and re-opened with File - Open. Platitude cannot produce graphic output now except on the screen. 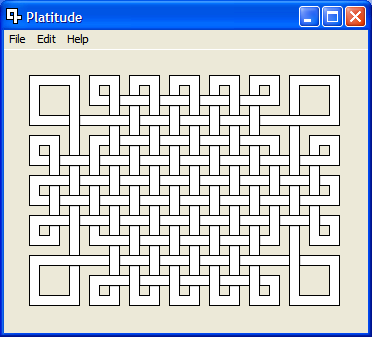 Use a screen capture to produce graphics files of your lattices. Other modification options, such as dragging out rectangles to invert. Other transformation options, including customizable operations like triplicate. Standard application features, such as undo/redo, printing, multiple documents, cut and paste. 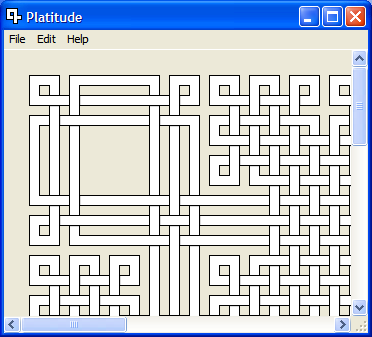 Analysis features such as counting loops, extracting loops shapes. Custom drawing styles, perhaps provided as tile images. I’d love to hear about your experiences with Platitude. Comment here, or send me a note. Lattice drawings, where I describe the origins of my interest in these lattices. My blog, where topics orbiting around Platitude crop up from time to time. Just wondering what you used to create windows installer with all required modules included. I used py2exe to convert the Python into a Windows executable with supporting files, then used InnoSetup to create an installer from those files. mmg: I've added msvcr71.dll to the kit, so it will be installed with the application. Thanks for pointing it out. Ned, I am a teacher at the highschool level. I have been searching for drawings my students could do plotting ordered pairs and connecting the dots (I teach Pre-Algebra) I ran across your site and wondered if you know where I could find any. I love this Platitude. Mitchell, I don't know where to find something like that, sorry. COOLIO!!!!!!!! you rock man!!!!! luv da site!!!!!!!! Very nice, have been playing with it for an hour or two with my beamer! I installed the program but when I open it I get a 'Fatal Error' message: Error while loding DLL 'unicows.dll'! The application will terminate now. Are you using windows 95, christina?